It is no secret that conventional produce is soaked with health- and environmentally-hazardous pesticides. Unless you’re going organic, every fruit and vegetable you buy comes with a dose of poisonous chemicals, though not all produce suffers from the same level of toxicity. 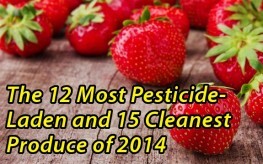 This is why the Environmental Working Group releases a list of the 12 most pesticide-laden fruit and vegetables every year, along with the 15 cleanest. Now the organization released the 2014 version of it’s ‘Shopper’s Guide to Pesticide in Produce’. Pesticide exposure is a major concern today. Passed in 1996, the Food Quality Protection Act led to a dramatic improvement in protecting the public from toxic pesticides. The Environmental Protection Agency has been responsible for protecting the masses, especially children, from harmful levels of pesticide for about 2 decades. But that wasn’t enough. Today, over 1 billion pounds of pesticides are used in the United States alone every year, leading to numerous health and environmental consequences. Among the many negative effects of pesticides, research has found that these chemicals can lead to cancer, birth defects, infertility, kidney failure, and much more. Monsanto’s Bt toxins are killing human embryo cells, while RoundUp and glyphosate are leading to a kidney disease epidemic in poor farming regions. It is for these reasons, among others, that individuals are looking to buy produce free of pesticides; it is also one of many reasons people oppose GMO crops, which require more pesticides than you can imagine. But even then, not everyone wants to spend more than needed on healthful, organic food. Well, now you can choose to go organic when selecting the most toxic of produce, and stick with conventional when shopping for something on the ‘Clean Fifteen’ list. Here are the ‘Dirty Dozen’ and ‘Clean Fifteen’. All imported nectarines and 99% of apple samples tested positive for at least one pesticide residue. A single grape tested positive for 15 pesticides. Single samples of celery, cherry tomatoes, imported snap peas, and strawberries tested positive for 13 different pesticides apiece. About 89% of pineapples, 82% of kiwi, 80% of papayas, 88% of mangoes, and 61% of cantaloupe had no residues. 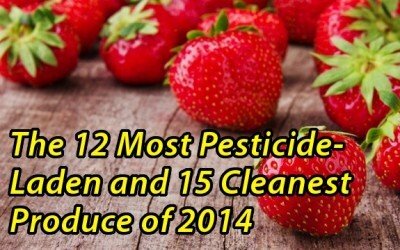 No single fruit sample from the “Clean Fifteen” list tested positive for more than four types of pesticides. On the clean list they need to state just what pesticides were found by name so they can be looked at and see if they are water soluable or can be cleaned with peroxides or oxygens etc.. really this goes for the bad list also. Nowhere does it state whether or not these pesticides “permeate” the food – meaning, do they pass through the skin and reside throughout the meat? Intelligent people want to know! Answers please. My friend used Roundup 1 time, thought he had the flu for a few weeks. His mouth was full of blood one morning & the Doctor at University of Tennessee Hospital said he had leukemia & they where seeing more & more cases caused by Roundup. ABSOLUTLY… AND THIS SHOULD BE IN THE NEWS FOR PEOPLE TO KNOW.. people are dying and getting very sick form these pesticides, (foods, & water) insecticides etc.. why nobody is saying something ? They are . . in the comments right here! Unfortunately this is not profitable news in the eyes of some people to make it to the big media to alert everyone. Still we have to research others’ claims on our own and always use due care. we need people to talk and scientist to make a serious study with these pesticides and tell the farmers too. What you might notice on this list is the fruits and veggies with the thickest skins are usually most protected from pesticide residue. Surprising that sweet potatoes are on the clean list though while potatoes are on the dirty list.